Qikost is one of the two massive natural satellites of Sanghelios, along with Suban. 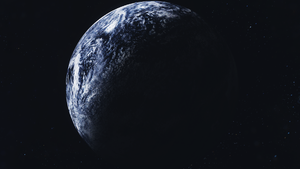 Qikost is silver in color and slightly larger than Earth's moon. The large size of both Qikost and Suban had great effects of the tides on Sanghelios. Qikost is home to large Sangheili population centers, major industrial sites, and many significant armories. The vast wilderness of Qikost is home to several Sangheili hunting preserves. Sangheili frontiersmen once used early prototypes of the Type-48 Revenant to traverse these preserves. Early in the Covenant's history, Qikost produced Sangheili swords of the highest quality, including burnblades. Partly functioning Forerunner ancillas were also brought to several armories on Qikost for studying purposes. Throughout the Human-Covenant War, a group of Sangheili merchants lived on Qikost and engineered weapons for the Covenant arsenal, and continued to do so for post-war factions. When Sanghelios became embroiled in a civil war, a significant portion of the planet's population fled to Qikost, Suban, and other Sangheili colonies. Qikost and Suban orbiting Sanghelios in Halo: Blood Line. Qikost orbiting Sanghelios in Halo 5: Guardians. Qikost and Suban as seen from the surface of Sanghelios.